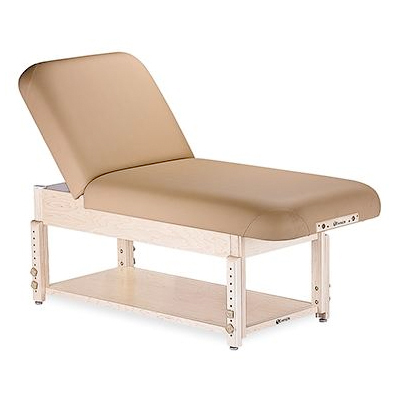 Crafted from beautiful Hard Maple, the Sedona Tilt stationary table comes standard with manually adjustable legs, sturdy hardwood frame and a luxurious, rounded corner flat top. 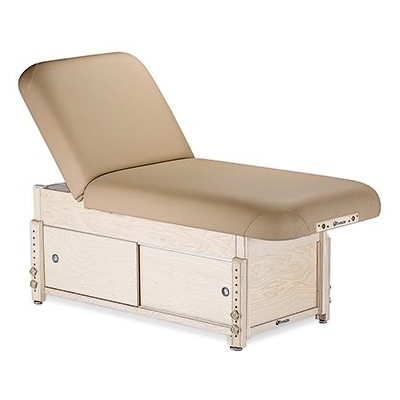 Generously upholstered with our Pro-Plushï¾™ Deluxe 3ï¾” cushioning system and covered with our sumptuous yet durable Natursoftï¾™ upholstery, the Sedona Series provides beautiful and affordable treatment table options for a broad range of customers. Premium Pro-Plushï¾™ Deluxe Cushioning ï¾– 3ï¾”, triple density system for ultimate comfort. Buttery soft, yet eco-friendly Natursoftï¾™ upholstery. Manual and PowerAssistï¾™ tilt and salon top options offer versatility. Non-electric ï¾– uses economical pneumatic assisted lifting system. Earthliteï¾’s proprietary One-Touchï¾™ Levers offer pneumatic assisted back and leg adjustments even while client is on the table.